To put this very bluntly, and without naming names, I've been a bit disappointed with the so-called summer blockbusters that have come out this year from the big publishing houses. I've been waiting for someone to get beyond same-old, same-old, and well, here it is. 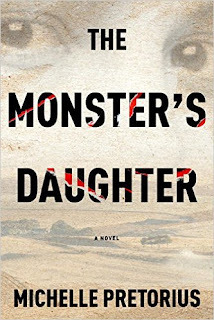 I can honestly say that The Monster's Daughter is an original. It begins in a normal enough way for a crime novel, with the discovery of a dead body, but trust me, there is nothing at all normal about this book. And that's a good thing. There are three different things going on here: first, one of the two main narrative threads has its roots in science/speculative fiction; second, the other thread follows a police investigation into murder, and third, when the two come together, the book serves as a vehicle for exploring a century of South Africa's troubled past and its repercussions in the present. It's this third aspect, I think, that made this book so incredibly interesting to me -- what a great way to take on such a difficult topic. So what you get in The Monster's Daughter is a sort of hybrid mix of sci-fi, crime and history, and if that's not original, I don't know what is. As I said earlier, the novel begins with the discovery of a dead body in the small South African town of Unie. It's December, 2010, and the victim has been burned beyond recognition, so it's going to be a tough job just trying to figure out who the victim is. Plus, the method of death is one that the detectives haven't seen in this area, so it's definitely unusual and seems to be some sort of smokescreen, creating a puzzle for the detectives to solve. As we're meeting the main characters from the present, the story then goes back in time to 1901, when the British were trying to get rid of the remaining Boers and were sending families to concentration camps. At one of these camps some bizarre experiments are taking place (and here's where the sci-fi edge comes in); eventually all of this comes to an end, but a bit too late and at a terrible cost. This movement from present to past continues throughout the book until, of course, the two storylines merge. As the crime story moves forward, Alet Berg, who is working on the crime, begins to uncover some pretty disturbing things that may not only jeopardize her already faltering career, but may also have some bearing on her personal life. She also discovers that the death of this victim may be one more in a long-running series of murders where the killer has never been caught. As time moves forward from 1901, we get a serious look at South Africa's violent apartheid history through the story of Tessa, who finds herself constantly having to change identities and homes to ensure her own survival. 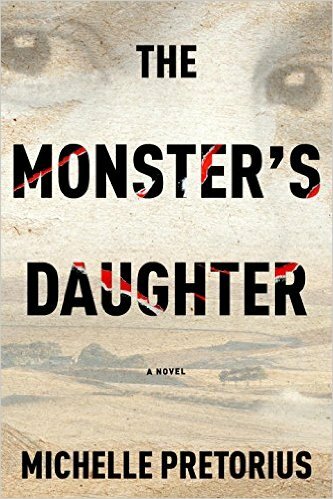 So -- I have to admit that when I first came across the parts about the experiments at the concentration camp, I did a major eyeroll since this is so normally not my thing, but as things turned out, I just decided to suspend any disbelief, relax, and roll with it and The Monster's Daughter turned out to be pretty darned good. I will say that it tends to get a bit boggy because there are so many things going on here -- for example, the author throws in some conspiratorial subplots that while important and germane to both present, past, and the novel's title, received (imo) way too much attention and time when all I really wanted to do was to get back to Tessa, South African history, and to the murder investigation. 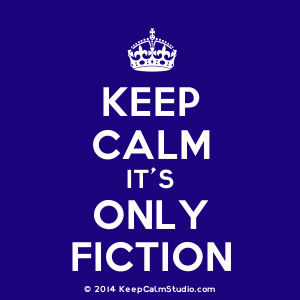 Then again, I'm not a big conspiracy fiction person, so that may just be a matter of personal taste. However, as I am so fond of saying, less is more, and this one could have been pared down some without any damage. Other than that, though, as I said, this book is definitely original, and would be well suited for historical fiction and crime readers who don't mind suspending disbelief (and let's get real here -- we do that in most cases anyway), and I'd also say for readers who are interested in the human costs of racism. Given the direction of today's politics, it might very well be worth taking a look at the past as so well presented in this novel. I really need to thank TLC book tours and to Melville House (one of my favorite publishers!!) for my copy of this novel. I'm just one of several readers of this book, so clicking on the link will take you to their thoughts as well. This book sounds interesting and if it delivers all your praise worthy comments, then it is quite an unusual blend of sub topics. I have to admit that visions of the concentration camps (a necessity to keep alive forever) is something that fills me great horror and sorrow, but your sincere enthusiasm for this novel make me want to read it.